What is the best way to develop a rapport with the interviewer? Can you recommend any particular resources for doing research on a firm prior to the interview? What if you’re asked to address your personal weaknesses? How do you address inappropriate questions, like are you married, or questions about politics? Does the adversarial nature of lawyers work against attorneys in a job interview situation? What’s the best way to summarize your entire background? What about under-qualified attorneys? How can they address a question about their background? How about after the interview … thank you letter or no thank you letter? What’s the best way to handle a bad interview? How can a qualified attorney screw up in the interview? “Are you interviewing anywhere else?” “Why are you leaving your present position?” or “Why did you leave your present position?” — how do you address this? What if you parted on bad terms? What about “How did you do in law school?” Can you honestly answer the question if you didn’t do well in law school or went to a bad school? How important are the clothes you wear? Any advice for the shy? How do you appear to be confident when nervous? What are the differences in interviewing with a big firm vs. a small or mid-sized firm? How should an attorney handle an interview in an unconventional situation? Law firms will often take you out to lunch or for drinks to get to know you. What are the differences between interviews with associates and junior partners and interviews with senior associates and partners? What about video conference and telephone interviews? How important is it to ask questions? What questions should be avoided? Can you recommend additional resources about law firm interviews? 1. What are the most important rules of thumb for attorneys to remember about law firm job interviews? Dress for success. The way you dress will reflect to the law firm how you will present yourself to clients and others. Give concise answers. Long rambling answers will always negatively affect your chances of landing the job. Let the interviewers draw their own conclusions. Don’t get into detail about previous work. Revealing too much about old jobs, clients, or cases will make you seem untrustworthy. Be aware of your body language. You can say a lot without opening your mouth, so remain conscious of it. Be honest. You’re not expected to be superhuman, so stretching the truth can only get you into trouble. 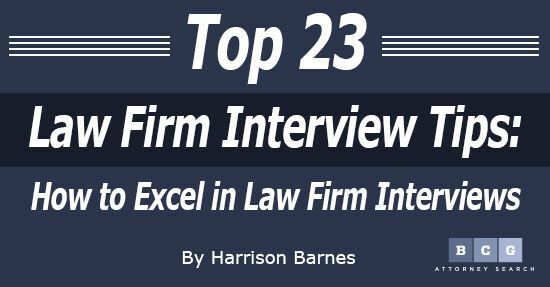 How many law firm interviews have you had so far? Let us know in the comments! 2. What is the best way to develop a rapport with the interviewer? 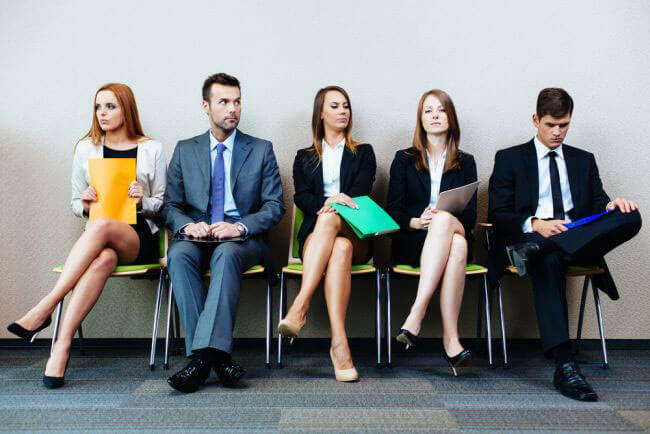 A job interview is like a blind date in that both sides feel a little nervous and forced. Standard blind date rules apply: nice handshake, maintain eye contact, smile when appropriate, and always listen! Listening is the most crucial part. It can be difficult for attorneys to get out of talking mode, but the interviewer should do about 80% of the talking. Paraphrase what the interviewer says back to him or her to show you are paying attention. Most people are uncomfortable with it, but it’s really a great opportunity to make an impression. Treat it like an essay in school and think about it before hand. Draw a correlation between how you describe yourself and the job description, be subtle, but connect your personality with the firm’s work. “What do you know about our firm?” How can this question be best handled? If you’re using a recruiter, they will do the necessary research and tell you everything you need to know beforehand. If not, always do your research. Use the Internet. Learn about the firm’s philosophy, successes, and history. 4. Can you recommend any particular resources for doing research on a firm prior to the interview? Review the law firm website. Review articles about the firm online. Talk to people you may know who have interviewed or worked at the firm. 5. What if you’re asked to address your personal weaknesses? This can be turned into a positive as well; say you’re a workaholic, that you can’t let a problem go until it is resolved. It’s best to keep everything positive, that way you create a positive association in the interviewer’s mind. How did you answer someone when they asked you about your personal weaknesses? 6. How do you address inappropriate questions, like are you married, or questions about politics? If you’re uncomfortable answering a question, and it is indeed inappropriate, just ask how it is related to the job. Be polite even if you think it’s inappropriate. 7. Does the adversarial nature of lawyers work against attorneys in a job interview situation? A job interview is not a test of wills, it’s an opportunity to demonstrate that you can think, listen, and articulate. Coming off as pushy or arrogant is a turn-off. Even if the job requires aggressiveness, you don’t want to seem like someone who is difficult to deal with. 8. What’s the best way to summarize your entire background? Even for law students and young attorneys it can be difficult to encapsulate their whole history in a few sentences. For experienced attorneys, it can be a nightmare. Stick to what’s relevant for the job you’re applying to. Refer to the resume; make it easier for the interviewer. Bring a list of representative casework. 9. What about under-qualified attorneys? How can they address a question about their background? The interviewer may have already made up their mind about whether you’re over or under-qualified, but you can make up for a lack of experience by expressing a personality match with the firm. 10. How about after the interview … thank you letter or no thank you letter? The cons of the thank you letter outrank the potential benefits. Even the most gracious and classy thank you letters can backfire. They can make you seem desperate like you have no other options. Its best to leave on a high note and thank you notes give you an extra opportunity to screw up. 11. What’s the best way to handle a bad interview? Don’t let it get you down because everybody has bad interviews. The most important thing is to always appear enthusiastic. After a bad interview, be sure not to let it show in the next interview. Lawyers need to be “up” when appearing in front of judges or clients, so it is crucial to show that you have an upbeat personality. Getting rejected after an interview is usually not your fault. Internal firm politics and issues of personal chemistry generally play a very heavy role in employment decision-making. What’s the worst interview you’ve ever had? Share it with us by commenting below! 12. How can a qualified attorney screw up in the interview? Showing up late is a sign of disrespect. Criticizing your last job is a major red flag. Lack of preparation will always make you look bad. It’s important to be confident, but don’t be arrogant or act like loose cannon. Never appear as though the job isn’t important to you. Don’t lie! Getting caught in a lie is the worst way to spoil an interview. 13. “Are you interviewing anywhere else?” “Why are you leaving your present position?” or “Why did you leave your present position?” — how do you address this? What if you parted on bad terms? You never want to say anything negative about your old firm. You don’t want to seem like a gossip. They will think you might badmouth them if they hire you. Turn it into a positive. Say that you want increased responsibility with a firm that offers growth or a firm that is a match with your personality and skills. 14. What about “How did you do in law school?” Can you honestly answer the question if you didn’t do well in law school or went to a bad school? Be honest. If you had good grades or went to a good school, it’s a plus. If you don’t want to mention the grades, steer the conversation to something worthwhile you did in law school (extracurriculars). Don’t be embarrassed of “ok” grades; grades aren’t everything especially if you’ve been out of school for a while. 15. How important are the clothes you wear? Clothes aren’t the most important factor, but they can’t be underestimated. No one ever got a job for dressing nicely, but people have lost out on jobs for not dressing nicely. Women: business skirt, low-heeled conservative shoes; avoid perfume and flashy jewelry. Even if the firm is more casual, dress conservative for the interview. 16. Any advice for the shy? How do you appear to be confident when nervous? Rehearse! Write up practice questions and answers. Do it in front of the mirror. Have a friend or relative ask you questions. Be thoroughly prepared for every possible question. Its better to be over-prepared than to be caught off guard. Try to relax, but don’t get too relaxed. Revealing too many personal details, taking off your shoes, or treating the interviewer like one of your pals can make you look like a crazy person. Are you a generally nervous or shy person? Did you appear confident in your past interviews? 17. What are the differences in interviewing with a big firm vs. a small or mid-sized firm? Many big firms have a set of procedures for interviews and things are more rigid. They will often have callback interviews, which is not a guarantee that you will get an offer. Smaller firm interviews can be less formal sometimes, but you should always appear conservative even if the interview is less formal. 18. What are the differences between interviews with associates and junior partners and interviews with senior associates and partners? Junior partners and associates are still “gunners” who are often in competition with the rest of the attorneys. Do not act too competitive or they might see you as a threat. Act friendly. Older partners aren’t usually caught up in competition with the rest of the staff. They will want to see a competitive edge. They will also be more concerned with things like grades. Act hard working and determined. 19. How should an attorney handle an interview in an unconventional situation? Law firms will often take you out to lunch or for drinks to get to know you. The worst mistake is to get drunk. If the interviewer is drinking, have the same thing and take it very easy. Eat at the same pace as the interviewer and only order the basics. Don’t order an appetizer or desert if the interviewer doesn’t, etc. This ties right into the whole notion of appearing conservative at all times. Mind your manners and always treat your servers with respect. The same goes for receptionists in the office. No one wants to work with a jerk, so always be courteous to everyone in the entire job interview process. Don’t let your guard down. Unconventional interviews like this test mainly your small talk skills, but you should approach them with the same level of respect and enthusiasm as any other interview. 20. What about video conference and telephone interviews? Law firms will often conduct telephone interviews before formally bringing you in for an interview. Technology is advancing and videoconferencing is becoming more and more common. It’s a great way to look for a job during a lunch break without battling traffic, etc. Don’t forget that they can see you. No nose picking, yawning, looking around the room. Have you ever done a video conference or telephone interview? Do you prefer those or do you prefer an interview in person? 21. How important is it to ask questions? It shows you’re paying attention and capable of critical thinking. Ask for more details about job responsibilities, how work is assigned, possibilities for advancement, and possibilities for independent decision-making. 22. What questions should be avoided? Don’t ask about salary, vacation time, working hours, start date. Don’t appear overanxious to get the job.